UK born Lady Margaret Turnbull, bed and breakfast guesthouse owner and amateur woman sleuth, couldn’t resist an open door of a mausoleum in Bangalow’s cemetery, New South Wales, Australia. Her busy body nature overcame the darkness and the smell of dampness, enticing her inside to discover a young woman, stabbed through the heart; her body wedged between two tombs. The museum doll facial appearance of the murdered woman, her expensive dress and Italian shoes deeply affects Lady Margaret. What was she doing in a cemetery after midnight? Was there a connection to her cooking class school? Was this a crime of passion or was she killed in a jealous tirade? In this latest international cozy mystery series, Lady Margaret must call upon all of her intuitive and crime investigation powers to unravel a 20 year old secret of the reclusive Pemberthy family, well known British land estate owners in the region. Detective Tom Sullivan once again is lead from pillar to post in another amateur sleuth murder mystery; much to his annoyance. 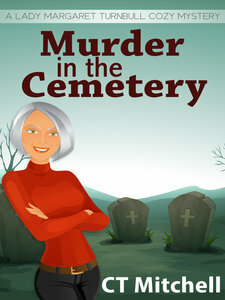 Murder mystery novel Australian author C T Mitchell once again delivers a cozy mystery full of twists and turns that will keep you guessing right to the end in this short story novella. As a bonus he includes a gripping chapter of the culinary cozy mystery, Murder in the Village.